When I took this photo, I thought it nicely represented a phenomenon that I call, "Daddy Doesn't Grocery Shop Like Mommy." You know what I mean. Dads buy different stuff when they are at the grocery store. Not bad stuff, just different. As an example, just this week, Mr. CM came home with four different varieties of yogurt. As in, different brands, not just flavors. I don't know why. I don't even ask. It's fine. 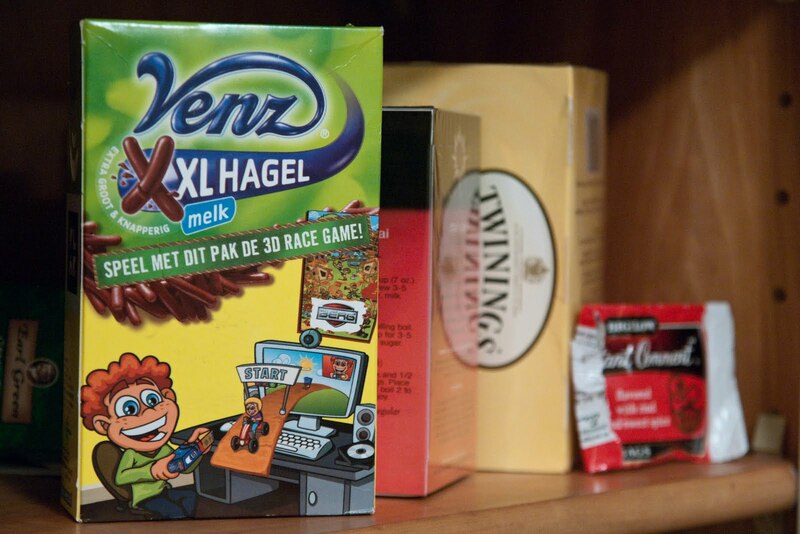 So, when I opened the cabinet to find this... and I didn't really even know what this is, because I don't read Dutch... I chalked it up to another case of "Daddy Doesn't Grocery Shop Like Mommy." I was wrong. Turns out, the box of chocolate sprinkles (extra-large, btw) was a gift from a co-worker, recently arrived from the Netherlands. Which leads me to another phenomenon I frequently observe, called "Shows How Much I Know..."
This was funny. You are a good tolerant wife. I'd have asked about the yogurt...... couldn't have helped myself. "Hagel" must be Dutch for "jimmies"